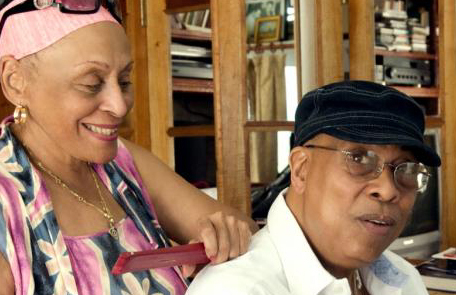 The last time veteran Cuban musicians, Omara Portuondo and Chucho Valdés, put out a CD together was back in 1997 with Desafíos. “We have wanted to work together on an album for a long time but because of our commitments it was difficult to find the right time.” To promote their new CD “Omara and Chucho” the legendary pair are currently on a European tour taking in Switzerland, France, Italy, Romania, Russia, Poland, Germany and Croatia before moving onward to the United States. At first sight, the awe-inspiring but abstractly aesthetic Renzo Piano Auditorium in Rome did not seem to be the ideal place for an Omara and Chucho concert. It is a massive hall and very sober – one imagines the viola players might have just packed up their instruments after a chamber music concert to make way for some Cuban samba. It did not feel quite right. Enter Chucho Valdés! The two-metre tall musical giant opened the show with a quick virtuoso performance on the piano accompanied by a three-piece band of fellow Cubans. Chucho’s immense stature is more than matched by his enormous versatility – which is immediately evident. In the space of ten minutes he has run the gamut from Latin jazz, touches of classical and more than a hint of total anarchy before pulling us back from the brink to his crisp sound and romantic melodies. He is a master. Don’t be fooled by the occasional simplicity! The curtains parted and the queen was set to take the stage. Omara Portuondo, now in her eighties, took a few hesitant steps from the semi-darkness of the wings then slowly made her way to the spot-lit microphone. The queen had arrived! The crowd clearly loved her and knew her repertoire by heart. You got the impression that the Cuban Embassy in Rome was empty that night. Everybody was at the Auditorium. Omara Portuondo’s hesitant steps are no indication of the state of her voice. Her first song ”Llanto de Luna” revealed a vocal range which goes from delicate romantic touches through to powerful rhythms that pin you to the back of your seat,. She has the power and momentum of a bulldozer. It comes almost as a shock. Chucho Valdés is the perfect foil to her powerful voice, his subtle skill at the piano and massive range takes you off in different directions: from Beethoven, to samba, to what sounded like a mixture of Sun Ra and Shostakovich. He loves to play around and he does it beautifully. Omara and Chucho are truly impressive in different ways, she with her massive voice and him with decades of well-honed genius. The concert is a conversation between the two of them (different as they are) and it works beautifully. The band is excellent despite being rather self-effacing; Julio Baretto on drums, Lázaro Rivero on double bass and Andrés Coayo on percussion. Chucho Valdés is no slouch! Not only is he on this tour with Omara but he has just released his own solo album “Chucho’s Steps” which won a Grammy for the best Latin Jazz album of 2011. Their very different characters come through on stage. Chucho is a truly large man but clearly a gentle giant who has nothing to prove – he is already a master of his art and a master of cool almost despite himself. Omara comes across as a very tough lady, often imperiously demanding applause for herself – no false modesty here!! She is a master of crowd control, having the entire audience on their feet even for her first number and calling for active participation on many occasions. Fair enough – the constrictions of a classical concert hall did require a bit of stirring up! Omara Portuondo and Chucho Valdés have both had long successful careers. Omara started out in the 50s playing American jazz standards before moving on to Bossa Nova. She formed her own group “Cuarteto Las D’Aida” and eventually went solo in 1959 when she made her own record “Magia Negra”, a mix of Cuban music and jazz. Many will recognise her from the Wim Wenders film: “Buena Vista Social Club”. Chucho Valdés, son of legendary Cuban pianist Bebo Valdés, began playing the piano at the age of three (it shows!) and started his studies at the Havana Conservatory at the age of 8. In 1967 he joined the “Orquesta Cubaba de Musica Moderna” and quickly made a name for himself. He won a Grammy award with Irakere in 1980. The list of people he has played with would be endless but a few of the major names are: Herbie Hancock, Chick Corea, Brandford and Winton Marsalis, Dizzy Gillespie and George Benson. In 1998 he started to work with a quintet format, producing four albums and winning two Grammy Awards. Before the concert starts, a lot of the talk is about Omara and Chucho’s distinguished age and how well they are doing after all these years, but once you are into the swing of the music, the age thing just drifts away and could not be more irrelevant. Just let Chucho take you on a trip across the keyboards and Omara pin you to the back of your seat with her powerhouse of a voice. Do whatever it takes to get a ticket.